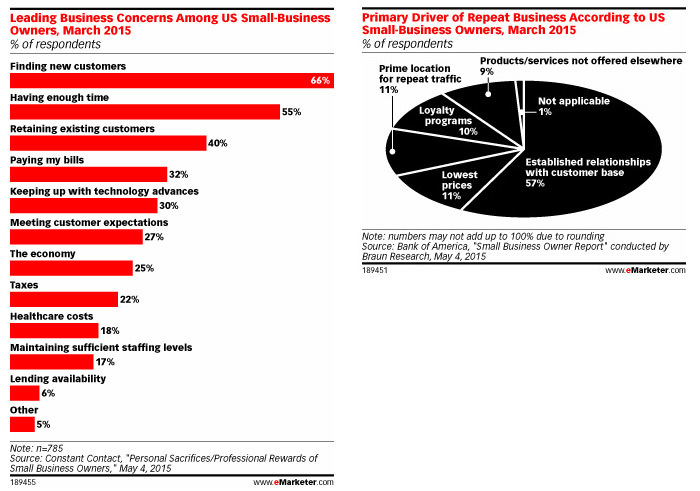 What’s The Leading Concern Among Small Business Owners? | ASTRALCOM - Content Strategy, Conversion Marketing and Customer Acquisition. What’s The Leading Concern Among Small Business Owners? Constant Contact did a survey in March 2015 that indicated finding new customers was the leading business concern among US small business owners. This eMarketer article states that, “When it comes to bringing in new business, word-of-mouth is still the most effective marketing channel for small and medium-sized businesses.” Search engine optimization and online local directories were the second and third most effective marketing channels for bringing in new leads and customers, followed by email marketing. The article further demonstrates that the majority of small business owners focus on building strong relationships as a primary strategy to keeping clients. Small businesses face a myriad of challenges in today’s always-on market. We can help. Just click or call us at 800.536.6637 and we’ll be glad to start a conversation on how to work together to keep your new client pipeline full.